Above: With his parents, Haralambos and Agathoniki (both seated) and sister, Chrysanthi. The older lady standing is a neighbour. Above Right: During National Service; I am seated. Above: With Fotios Milles (right) and Stelios Drakoumalis (left). Above Right: Celebrating his engagement with his fiance and friends. Next to Anastasios is his fiance, Efstratia Zafirelli, followed by Katina and Stella Stavrinou. 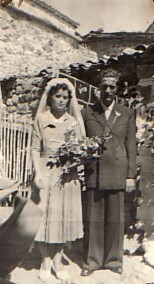 Above: On his wedding day in Antissa- with his bride, Efstratia. Above Right: In their garden- with Efstratia.